One of the most frequent complaints about waffle makers is that they cook unevenly. This means there are differences in crispiness and color across the waffle plus there are even some that cook one part of the waffle whilst another part is effectively left as uncooked batter. There is a simple solution to this uneven waffle cooking and it is a flip waffle maker. 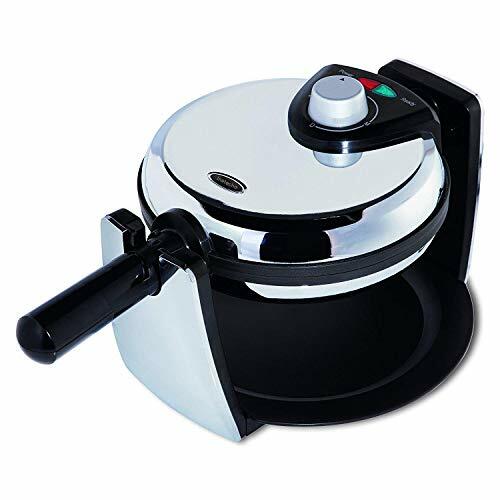 Flip waffle makers can be rotated during cooking so that the batter is evenly distributed and cooked. In this review we’ll assess three of these and determine which is the best flip waffle maker. 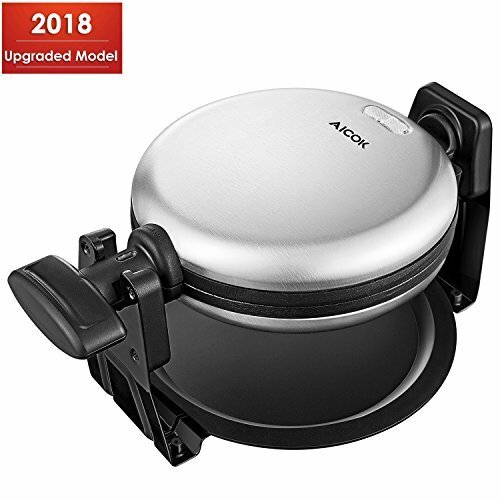 This is an ideal flip waffle maker if you like your waffles evenly cooked, and also to your preferred color and texture. It’s easy to use, easy to clean and easy to store. This Oster flip waffle maker is made from strong chrome, so it should stand up to any knocks, and with a black trim for the base and the handle, for example, it has a simple but modern appearance which will look great in most kitchens. Cooking your waffles is assisted by the indicator lights on the top which light up to tell you that the waffle maker has reached the desired temperature. That temperature will be determined by the setting you select on the adjustable temperature control. This enables you to cook waffles which are either light and soft, or darker and crispier. Browning and crispiness preference will differ from person to person, but one thing every lover of waffles agrees on is that they want their waffle to be evenly cooked. Thanks to its easy flip feature you can rotate the waffle maker as it is cooking so that the batter is evenly distributed within the plates. The result will be your waffle coming out with no uncooked batter and even color and texture throughout. If you have poured in too much batter to start with, as you flip the plates there is a possibility of some liquid dripping out. Oster has clearly thought about this issue as they’ve designed the base of this flip waffle so that it also serves as a drip tray, thus avoiding any mess on your countertop, and the need for subsequent cleaning up. On the subject of cleaning up afterwards, this is always the downside of cooking but thanks to its non-stick plates you should not have to put too much effort to clean this waffle maker. In addition, the drip tray we’ve just mentioned is removable, so it can be cleaned easily too. After you’ve eaten, and cleaned up, it’s time for your flip waffle maker to be put away. Given how good it looks you could simply leave on the counter, but most likely you will want to store it in a cupboard. To help you do so, the lid is clamped closed, the handle folds down, and you can also flip the plates on their side. This means the waffle maker can be stored vertically whilst taking up the minimum of space. Given its all black appearance, this is certainly the most distinctive flip waffle maker we’ve reviewed, but it is not just its looks that earned it plaudits. It also makes great waffles, and does so with the minimum of fuss and effort. This flip waffle maker from Gourmet might not win any prizes for looking pretty and petite, but then again beauty is said to be in the eye of the beholder. Being all black it is obviously going to look a bit out of place in a rustic style kitchen but that apart we love its bold styling. The main part of the waffle maker is made from brushed stainless steel, which bodes well for its longevity and ability to resist corrosion. The main plates are circular with a cross to divide the waffles in the middle, therefore any waffles you cook with it, will be the recognizable quartered wedge shape. The benefit of this waffle maker is you can double up and instead of just cooking one waffle you can opt to cook two. When ready you can eat them all yourself or share them with others. Far be it from us to tell you which is best. In terms of making your waffles, you obviously switch the grill on and then wait until the indicator light comes on, which will mean it is up to temperature. Simply pour in your waffle batter and then close the lid to start cooking them. The beauty of this flip waffle maker is that you can rotate the plates, so your batter is evenly spread and thus evenly cooked. This means no soggy uncooked bits or some parts crispy and others soft. As you flip the waffle maker you may have some uncooked batter leak slightly, but it won’t create a mess thanks to the drip tray which forms part of the product. This can be removed and cleaned once you have finished cooking your waffles. As for cleaning the cooking plates, they can often just be wiped with a damp cloth when they have cooled down due to the fact they are coated with a non-stick material. However, if they need a more thorough clean then all four plates can be removed by moving the tab which holds them in place. Finally, if you need some inspiration to make your waffles more delicious and even exciting, then the Gourmia flip waffle maker comes with a free recipe book with loads of ideas you can try out. This is a simple flip waffle maker which does a great job of cooking waffles evenly. It’s easy to clean plus being light and compact it is also easy to store away when not being used. We often come across small appliances with loads of extra features that don’t have any real benefit and do nothing more than give the manufacturer an excuse to ramp up the price. With the Aicok flip waffle maker you are certainly not going to see loads of extras but then that is part its appeal. It’s simple and straightforward, does what it is supposed to, and its price certainly makes it great value for money too. Let’s look at its main function of cooking waffles and how easy it is to do. Even taking it out of the cupboard is not going to be a struggle given that it only weighs 3.3 pounds which makes it one of the lightest waffle makers we have ever reviewed. Size wise it’s not going to make the biggest waffles in the world but that won’t detract from how good they taste. After switching on your flip waffle maker and allowing it to heat up, you can then pour in your waffle batter and close the lid. It has a catch to secure it whilst cooking and then at any point, you can flip the plates by turning the heat resistant handle on the side. This ensures that there is no danger of you getting burnt when turning the handle and that your waffles are cooked to an even crispness and color. Whilst cooking you will see an indicator light on the top plate which will be blue whilst cooking. When the waffle maker has cooked the waffles and they are ready, the light then turns green. There is an indicator light on both halves of the waffle maker so that even after you flip it, you can still see a light at all times and obviously know when your waffle is ready, no matter which side is facing upwards. One feature to note is the drip tray underneath the cooking plates which will catch any spillage from between them as they are flipped around. This tray can be removed and cleaned easily. The non-stick cooking plates will normally just need a wipe down with a damp cloth to clean them. 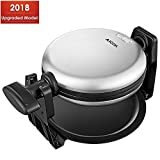 Once again, we have a scenario where all three of the products reviewed are highly recommended, but we must choose a winner and in this category of the best flip waffle maker we’ve chosen the Oster Flip Nonstick Belgian Waffle Maker. With its black trim and chrome body, this waffle maker is not only very pleasing on the eye, but it also gives the most control over cooking waffles of the three reviewed. There’s an indicator light to let you know when it is ready to cook, plus you can adjust it to your personal preferences whether that is light fluffy waffles or crisp waffles. Its space-saving design which allows you to store it vertically is also a big plus and with the handle folding down there should not be any issues in terms of storing it away when not in use.